Discovering some simple old truths and newer complex ones at a festival that fuels the art and science conversation with panache. TORONTO — Celebrating its twentieth year, the Subtle Technologies festival positions itself at the intersections of art, science, and technology, investigating what these interdisciplinary practices look like today in light of pertinent political, ecological, aesthetic, and ethical questions. The festival brings these intersecting spheres — science, ethics, aesthetics, ecology, Indigeneity, food systems — together to reveal what comes about from their joining. Subtle Technologies is effective in its navigation of the unique possibilities and challenges that inter-disciplinarity brings. On the one hand, these spheres — art, science, technology — are not so much separate as they are deeply intertwined. Lisa Myers’s Cooking-as-Inquiry workshop is as much food as it is science, as much about Indigeneity as it is sustainability, ecology, land history, and the politics of food systems. On the other hand, there remain some important distinctions between the concerns of aesthetics, at least historically, and the empiricism of the scientific method. Indeed, how to best bring together art and science without treating one or the other superficially is an ongoing challenge that confronts both artists and scientists curious about making kin with ‘the other side’. With Subtle Technologies, we find an example of how best we might go about this. 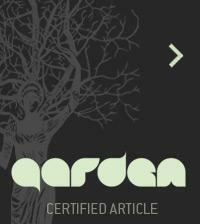 In proposing how to bridge knowledge with ethics, science with aesthetics, ecology with Indigeneity, in ways that are ethical and effective, in ways that are not superficial or tokenistic: it is here that Subtle Technologies succeeds, and has something important to offer international art communities. The Subtle Technologies festival took place over two months, beginning on May 10 with an opening reception at Inter/Access gallery for the contemporary art exhibit Cultivars (Possible Worlds), and ending on June 26 with the close of a site-specific installation Visitors: Singing Plants (Redux) at Evergreen Brickworks. This year, the festival’s programming was organized into seven key events taking place around the city of Toronto, some of which were one-offs — such as the Ink, Brush & Fork squid-dissection workshop at the Depanneur restaurant, or the Hydroponics for Creative Practice workshop at Inter/Access — while others took place over a series of weeks, repeating and evolving over the festival’s run. This was the case with Lisa Myers’s Cooking-as-Inquiry, which ran every Tuesday and Wednesday evening in June, and the Indigenous Plants/Indigenous Histories foraging walks, which took place ever Saturday and Sunday afternoon in June: both series were held at the Evergreen Brick Works, a community environmental centre on the site of a former quarry and brick making factory in the Don River valley. As a longtime vegetarian, as a writer and curator, and as someone intrigued by the intersections of art, science, food, and social change, I was drawn to the programming at this year’s festival. As someone who has only lived in Toronto for three years — and who has been immersed in PhD studies for the majority of those three years — I’m embarrassed to admit that I only learned about the festival this year. That is one of the things about living in Toronto: there are so many festivals happening all throughout the year, and so many art exhibitions and programs to attend. Subtle Technologies stands out to me for its ambitiously interdisciplinary programming, experimental approach to outreach, and deep and clear indebtedness to practice alongside theory. “Ink, Brush, Fork” at the Depanneur, 1033 College Street, Toronto. Led by Lisa Carrie Goldberg of the Action Potential Lab. Cheffing by Christopher Showalter. “Have any of you done a dissection before?” Lisa Carrie Goldberg, founder of Action Potential Lab, asks the group of us seated across three tables in the Depanneur on College. It’s a cozy space, and Lisa is bubbling with the nerdy fervour of a facilitator who loves showing adults and kids how fun science can be. I raise my hand, and cite my experience ducking out of the fetal pig dissection in high school Advanced Biology on the grounds of my newfound vegetarianism. "Is the violence of my cuts somehow negated by having learned more about the squid?" It was arguably my resistance to dissection that made me move from my ‘pre-med’ studies as a science student at University to a fine arts student studying art history, literary theory, and studio practice. Something about the dissection of a body that was once vital, once sentient, once conscious, was troubling to me on a visceral, existential level that I could not shake. The workshop facilitators bring around fresh, once-sentient squid on shiny white dinner plates, placing one in front of each of us. There is a basket of lab tools—new scalpels and dissection scissors — for us to use. I look down at the squid, its rubbery flesh a marbled purple and white. (“The corpse is the utmost of abjection.” — Julia Kristeva). There’s a violence to science, sure, but perhaps only literally—the act of cutting through skin, flesh, organs, an eye... My scalpel touches the iridescent film in front of the squid’s left eye and blackish, purplish blood (is this ink, leaking?) pours out onto the clean white plate below. Is the violence of my cuts somehow negated by having learned more about the squid? Are all forms of awareness valid, or valuable, or empathy-generating? Does making an incision into the squid teach me better how to be in the world with the squid, and how? “The squid is the smartest cephalopod,” Lisa explains. As scientists we learn about their bodies, and as artists we learn about their bodies, too. I, for instance, learn that the squid’s nervous system is located up and down along the lengths of their eight legs, in their suckers. They are polymorphously perverse (Freud), I think to myself—they are sensate across the surface of their bodies in a way that must be at times enormously painful, and at others hopefully pleasurable. I’m intrigued at how the brain-body of the squid is essentially interconnected, and wonder if we can extend this to our understanding of humans: we still seem so indebted to a Cartesian dualism, dividing the “mind” from the “body,” as if that were ever possible. "I wonder whether this acceptance of a fundamental ambivalence at the core of reality is what maturity is." 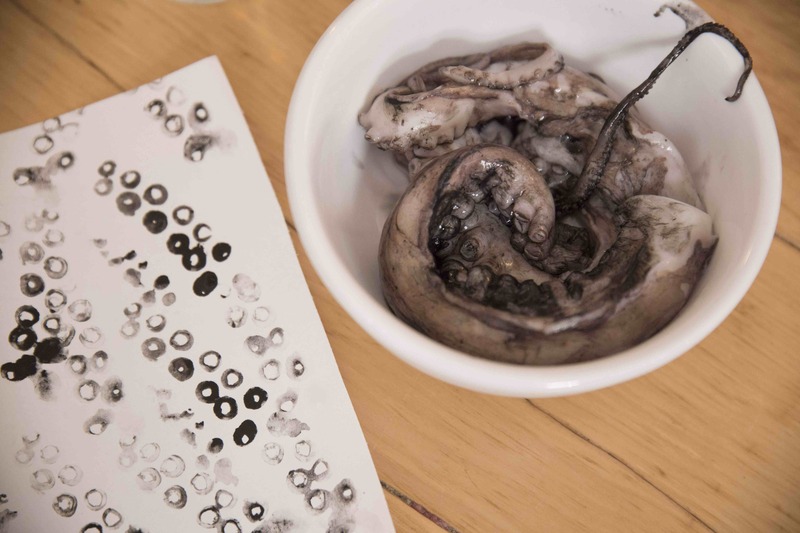 In this workshop we extract parts of the squid’s body to make art. I locate the “pen” — the plastic-like skeleton of the squid — and pull it out from the bottom of the mantle. This will be the pen we use to inscribe with, to make our mark on paper. I locate the ink sac within the mantle, below the gonads and the squid’s three hearts (a lover) and the siphon, and cut it out using my scalpel and dissection scissors. It doesn’t feel as violent as it did when I was a teenager, and I wonder whether this acceptance of a fundamental ambivalence at the core of reality is what maturity is. I’m finding a tingling kind of joy in these flesh cuts, and fear that I’m becoming some kind of sadist. No, just a scientist: this work has a purpose, and maybe I’m too sensitive to be a scientist so I remain an artist who presses up against science with a gentle and generous curiosity. The way that this workshop approaches the squid reminds me of the little I learned about First Nations people growing up in the public school system of Regina, Saskatchewan. In our Social Studies/History class, we were taught how the Plains First Nations used all of the parts of the bison. The bison: this creature that was once integral to the ecology of the prairies, now almost extinct (how this happened was never mentioned, nor the parallel attempts-at-extinction of Indigenous people in the ongoing colonial project that is Canada). Nothing of the bison was ever wasted: the First Nations folks used the hide, the meat — even the stomach became a vessel in which to store water. “Eeeeewwww,” our child-selves thought (or said). And now with the squid: we extract what we can use for art-making—the “pen” and the ink sac—and use the rest of the squid for food. Nothing of the squid is wasted. Chef Christopher Showalter took each of our dissected squids and turned them into a gorgeous meal. As we exit the Depanneur and walk out into the cool Toronto night, our hair and our leather jackets, our sweaters and our skin smell like raw squid, cooked squid — beautiful squid. “Indigenous Plants/Indigenous Histories,” part of “Wild City,” a co-presentation between Subtle Technologies and the Evergreen Brick Works. “Excuse us!” A woman on her bicycle has encountered our group along a path in the Don Valley river valley a few steps away from Evergreen Brick Works. We’re blocking her path, mis-using the space of this path by standing in a group, precluding cyclists from passing. Again she raises her voice with an entitled certainty: “EXCUSE US!” She and her child, also on a bike, attempt to move past us. She doesn’t really mean for us to “excuse her” — she isn’t really humbling herself in the aforementioned excusing. She’s shaming us, in that quintessentially Canadian, passive aggressive, middle-class white woman way, and shouting over Phil Cote, an Indigenous artist and elder who is generously giving those of us on the foraging tour (“Indigenous Plants/Indigenous Histories”) some background into the Indigenous uses of staghorn sumac. True, we’re technically in the wrong, but still. I’m embarrassed for everyone, and feeling shame myself when confronted with this embodiment of European entitlement over land, resources, and space. We shuffle slightly to the side as the woman bikes past us, pissed off because we’ve clearly gotten in the way of her nice afternoon plan of cycling with her kid. 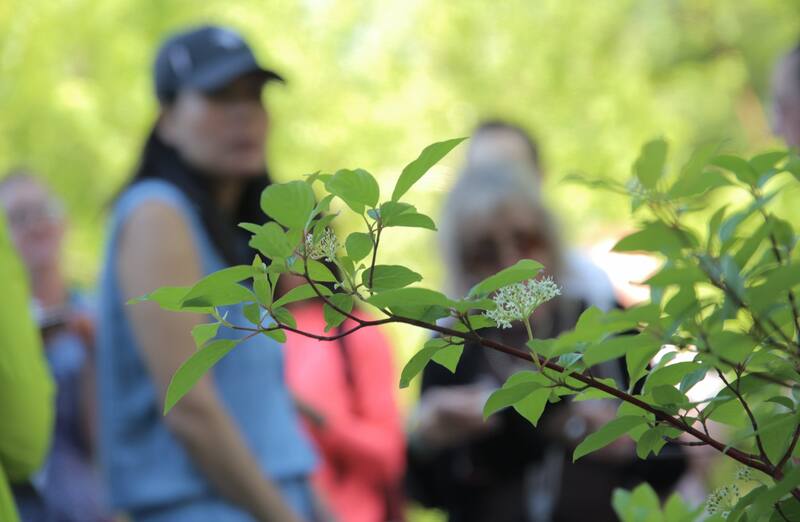 Joining Phil Cote in leading the foraging tour are Indigenous Professor Jon Johnson, and outdoor educator Lee Earl of the Wild Foragers Society. Working together, Cote and Johnson provided histories of the land that we walked along (now called the Don River Valley, on the west bank of the Lower Don River) from an Indigenous perspective. Each tour leader emphasizes the use of plants as sacred medicine that works on our bodies on spiritual, emotional, and physical levels. Both Cote and Johnson are involved with the First Story Toronto, “a program at the Native Canadian Centre of Toronto devoted to researching and sharing Toronto’s Indigenous heritage through a variety of popular educational initiatives.” Participants in the foraging tour were encouraged to download the First Story Toronto smart phone app, which maps stories of Toronto’s Indigenous heritage across the GTA (Greater Toronto Area). Throughout the tour, it becomes clear that Indigenous futures are tied both to Indigenous presents (presence) and Indigenous pasts. Running deep throughout both Cote’s and Johnson’s articulations is the need to decolonize Western notions of both history and the land—particularly important in light of the Indigenous politics of Canada’s sesquicentennial celebrations. At the heart of the tour were notions of politics, aesthetics, and ethics of foraging, even if these weren’t articulated as such. By foregrounding Indigenous knowledge of the land, plants, medicine, and food, Subtle Technologies showed that it is serious about centring the voices and perspectives of Indigenous people living in what we now refer to as the GTA. The retinal-emphasis of Cultivars (Possible Worlds) opens up here to a more multi-sensory experience as we walk outdoors, taking in scents and tastes of different plants. While a sustainable, stewardship approach to the land was emphasized, we gained knowledge of Indigenous plants, including the use of cedar tea for colds, and how white pine bark and burdock are used in cancer medicine. Red clover has been used to prevent breast cancer. Horsetail has silica, so when you do a decoction (low simmer) you can use the silica-rich salts for hair and nail growth. Also, you can chew spruce gum when you get a sore throat. Rose hips are a great source of vitamin C, white lily has medicinal uses, comfrey can stimulate growth hormones in both humans and plants. For medicinal purposes you must make sure the plant is completely dry before you store it, in order to prevent mold from growing. As the tour proceeds, it becomes increasingly participatory. My fellow tour participants begin to share their own knowledge in relation to the topic at hand. A beekeeper tells us about her use of sumac in the smoker — it produces a cooler fire for the bees, she explains — while an Indigenous woman, and creator of Tibo Teas (which can be purchased at local shops), shares her first-hand experiences of differentiating poisonous from medicinal plants in the wild. We continue walking up the hill. The sun is coming out and a woman a few meters away from us is posing in front of the chimney that reads “VALLEY” along its length, while her partner takes her photo with his smart phone, marking her spot on the land. We walk up the hill to the top of the Don Valley, with a view of downtown Toronto’s skyline to the southwest of us. Phil announces he’s going to share a smudge ceremony with us. We’re seated in a circle, in a cemented-off area that, from the residual bricks and ash, I take to be the sanctioned area for people wanting to have a fire. There is shattered glass and cigarette butts at my feet, and I imagine that this must be a prime hang-out spot for teenagers or young adults experiencing a prolonged state of adolescent rebellion. Cote lights the sweetgrass and begins to smudge himself. He describes the importance of the smudge ceremony for Indigenous peoples in the present: “Going beyond trauma in order to move forward” — the trauma of colonialism, of the loss of culture and language, land, identity. He speaks of the importance of “turning back toward our history before we move forward.” Of course, I say to myself. Of course. The idea of preservation of culture being tantamount to the reclamation of cultural identity makes sense to me. But this generosity isn’t an invitation to keep taking. At least, I don’t think it should be. Haven’t we taken enough? As the smudge ceremony comes to a close, Phil leaves us with a final vision that he has received in the trance-like experience brought on by the smudge ceremony: the image of an eagle’s claw coming down as a kind of messenger, “holding us” in white light. “We’re all in a good place,” Phil tells us. Lee begins pouring sun tea into ceramic mugs, offering that we choose from the two brews she’s had sitting out in large mason jars in the sun. I come up to Phil and thank him for the day. We shake hands. The tour has ended and people are moving around the cement circle at the top of the hill, removing layers of clothing as the sun becomes hotter. As I pull my sweater over my head, the young man from earlier — the one who really wants to take a course in foraging — comes up to us and begins to speak to Phil. I step back about a foot, making way for their conversation, familiar with this feeling that I sometimes get as a woman. X begins to speak to Phil. He asks Phil if it was okay for him, as a European person — fumbling, he cites his ancestry, Irish and British — to have a relationship with this land. X seemed to be asking, in a respectful and somewhat deferential way, if he could have permission to use the land, to forage and to not feel guilty when doing it. The question is honourable enough, and I’m curious about Phil’s response. But the tour participants are moving around me, the sun is beaming down on my head, and I don’t hear Phil’s answer. Setting my glass of sun tea down, I start to walk down the path that winds back toward the Evergreen Brick Works. I take a deep breath and look at the land around me, and for a moment — just that moment — feel an enlivening sense of peace. As I reach the sprawling complex of the Evergreen Brick Works, I can hear Mexican music swirling out from the Sunday market, and middle-class moms and dads moving into the shade that the market provides. READ Part 2 of this series, "At Subtle Technologies 20.